Posted on March 27, 2017 at 10:20 am. As part of the Ashram’s programming experiment to invite in new audiences, on June 5 – 10 we welcome back Dr. Don de Guerre, as guest collaborator for the second annual Decelerator. Together we will explore: How are my actions aligned with my purpose? What shifts need to be made to bring more balance into my life? Decelerator offered me a space to slow down, reconnect and allow insights to emerge. Through personal reflection in the morning then connecting back to my work in the afternoon, I gained a valuable new perspective – especially on my role as president of the Ashram. Since my work, my life and my purpose are all intertwined, there was a gift in the invitation to specifically look at work to learn about myself. The retreat’s design and five-day format gave me plenty of silent time and space alone, which was refreshing and insightful. I also appreciated the many inspiring participants from diverse fields—from university professors, to nonprofit workers in Africa, to executive directors and entrepreneurs. I left Decelerator re-energized, newly appreciative of the Ashram and the space it holds. The memorable hike up Mt. Crawford symbolized the beautiful and wide perspective I gained through this special retreat. Highly recommended! 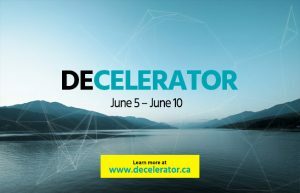 Find out more about last year’s Decelerator.